Reach Paradise: What are You Doing with Your Talents? Today’s Gospel reading, Matthew 25:14-28, always causes me to pause and think about what I am doing to further God’s kingdom here on earth. 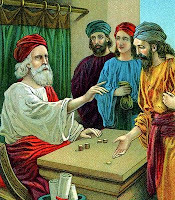 The reading recounts Jesus’ parable of the talents (a form of money in those days). A man gave his servants talents to watch over while he is traveling. One servant received 5 talents, another 2 and the last 1. When the man returned, the servants that received 5 talents and 2 talents returned 10 talents and 4 talents to him, respectively. They had traded and doubled the money. The last servant buried his one talent in the ground, and thus, returned just the one. The master lauded the first two and invited him to share in his happiness, and reprimanded the third - sending him outside “where there will be wailing and grinding of teeth”. The meaning of this parable is very clear to me. God has given us all a variety of talents (and I don’t mean the money kind). Some of us have many talents (like the servant who received 5) and some of us have less. But quantity is not the issue here. Its clear from the parable that both the servant who received 5 and the servant who received 2 were invited to share in their master’s happiness (Heaven) because they did good things with what they were given. In contrast, the last servant was sent away (Hell), not because he started with only 1 talent, but because he did nothing with it. Every time I hear this parable I ask myself if I am doing enough with the talents God gave me. And each time, I strive to do more than I am currently doing.